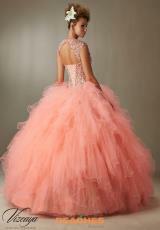 Magnificent Vizcaya ball gown dress 89068 features an intricately beaded bodice and ruffled tulle skirt. 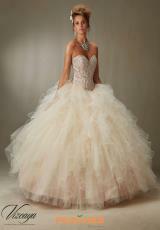 Showcasing a sweetheart neckline and form fitting corset bodice with removable coverlet. Twirl around like a princess in this full tulle skirt. Wear this dress to your quincenera or sweet sixteen. Add a matching stole and long dangling earrings to top off this look. Shop Vizcaya dresses at Peaches Boutique.